The tenth-ranked Florida softball team (7-0) used swept a midweek doubleheader with Mercer in the 2008 home opener at Katie Seashole Pressly Stadium on Wednesday to improve to 7-0. The Gators' bats produced 17 runs on 17 hits in the doubleheader, winning the first game 5-0 and the second 12-1 in five innings. Freshman Megan Bush led the Gators, going 4-for-6 in the two games, including a perfect 3-for-3 performance in game two. Freshman Aja Paculba and junior Ali Gardiner each went 2-for-2 in the first game with Gardiner tallying three of the Gators five RBI in the game. Sophomore Francesca Enea finished the doubleheader 3-for-5 with two runs scored and four RBI. The Gators stole eight bases through the two games, including three from junior Kim Waleszonia. Junior pitcher Stacey Nelson struck out nine and improved her record to 4-0 on the season in game one, while freshman Stephanie Brombacher pitched 4.1 innings in game two, striking out four to earn her third win of the year. Freshman Kristen Adkins pitched the final two outs in her first appearance of the season. 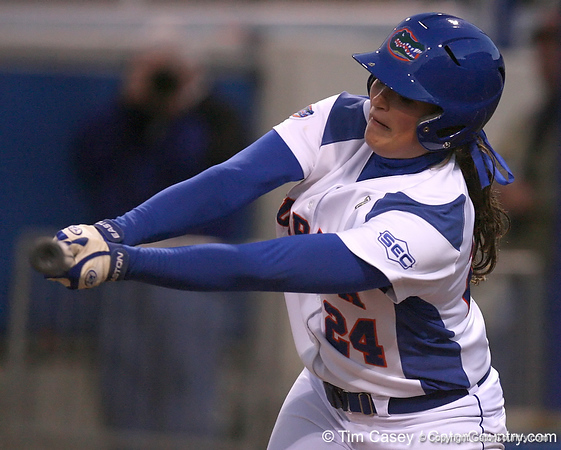 during the Gators' sweep of the Mercer Bears in a doubleheader on Wednesday, February 13, 2008 at Katie Seashole Pressly Softball Stadium in Gainesville, Fla.